The Art of War is a Chinese military treatise that was written by Sun Tzu in the 6th century BC. Composed of 13 chapters, each of which is devoted to one aspect of warfare, it is said to be the definitive work and one of the oldest and most successful books on military strategy. It has had an influence on Eastern military thinking, business tactics, and personal success. The Art of War is a must-read for anyone pursuing long-term goals and searching for success. 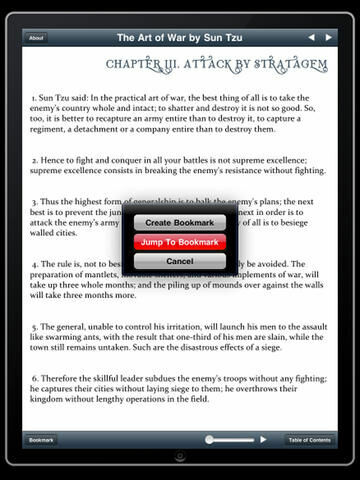 Now available for the iPad with functions that allow readers to Zoom, Read in Lanscape, and Create Bookmarks. Optimized Table of Contents for easy chapter lookup and referencing.